In 1956, Märklin was still feeling the effects of the Second World War as they had to adapt to the changing environment in Europe. 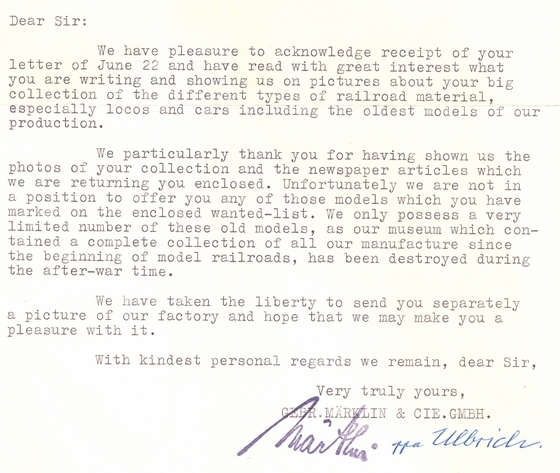 The following letter below was sent from the Märklin factory to a collector in Illinois in the year 1956. 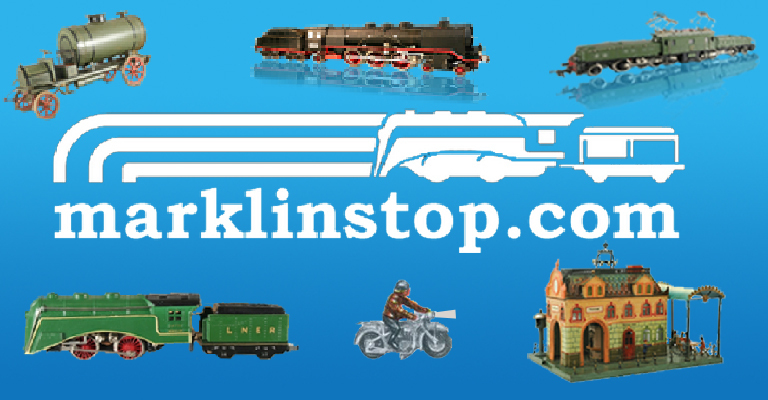 Many other references and books specifically declare that Märklin facilities remained untouched during World War II and that Märklin continued producing trains and toys shortly after the war ended. Thus, Märklin had to maintain a friendly relationship with allied soldiers in order for them to remain production under the unstable German government and situation. Knowing that many American soldiers would possibly try to prevent this production and manufacture of Märklin’s toys, Märklin produced a special “starter set” for American soldiers during and after the war. This set was sold in a plain brown box (red ink was not used) and stamped on the outside with marking numbers. The sets included the correct voltage for US use and contained either an SK 800 or RS 800 locomotive with passenger cars, rolling stock, track, a transformer, and other accessories. 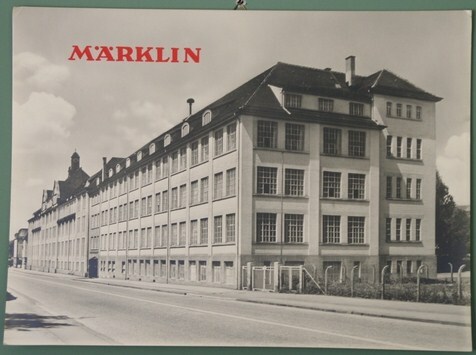 The only piece of information that we can know with absolute certainty is that the Märklin factory stood strong in 1956 as seen in this factory photo which accompanied the letter in a large brown envelope. This may interest you in the subject of Maerklin wartime production and immediate postwar production. Fabrik in Göppingen mit dem Schild über dem Dach GEBR. MÄRKLIN & CIE. Arbeiterinnen bei der Arbeit an Spielzeugeisenbahnen mit Schraubenschlüssel und Feile. Männer prüfen kleine laufende Fahrzeuge. Jungen vor einem Schaufenster mit fahrender Spielzeugeisenbahn. MÄRKLIN-Bahnen auf Bord im Laden. Soldaten als Zuschauer der Modelleisenbahn und beim Kauf. Factory in Goeppingen with roof sign which says “Bros. 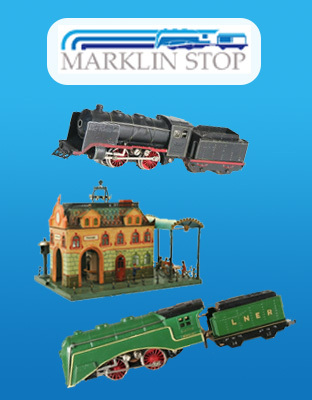 Maerklin & Company”. Female workers making toy trains with a socket drive and a file. Male workers testing small running vehicles. Boys watching toy trains running in a shop display window. Maerklin trains stacked in a shop. Soldiers (American) watching model trains (in shop) and purchasing them. The production of toy trains in the Maerklin factory is described. The assembly of an SK 800 E is shown. A display window layout with an SK 800 and four 350 passenger cars operating is shown, in the background perhaps an RS 800 N is seen. A number of American G.I.’s are shown discussing with the toy shopkeeper the contents of a 1936 Maerklin catalog, are shown a display layout from Maerklin and the soldiers are finally shown with a large package of Maerklin trains leaving shop. My hat of for the Märklin Company that stod rather firmly to the nasi-goverement during the time they was in power. I know of no other German company that did that. All other companys turned the the flag in ton wind and they did everything the could to please the nasis. Märklin did not !!! I have now checked the Märklin catalogs from the relevant time (1935-1940) and I found only two nazi-reladet items. 1. A flag 2. “the fûrers Mercedes. The first one was hidden in a suplement, the other one was not. However one has to understand that this was in a time that You had to be a Nazi — and the Märklin-company was not !!! !